Looks cool. And can anyon say me, witch Map/Add On tis is? The Zeppelin I have and works fine, but what is that for a mission/map/add on? And are there more games/Mods with that feature? Hello. Anyone know some WWI/ WWII Air combat Games or Add Ons, where I can attack big Cities with Searchlights (Night-Air Raids) and Air-raid-sirens, like London, Berlin? It must be very cool, wen I attack a big City with my Zeppelin, or a nice B-17 and when I come closer to the City, the Air-Raid-Sirens wail, the searchlights capture my plane / Zeppelin......hope you understand, what I mean. PS:Sorry for my english, I'm german. The ships are flyable. Look at the link in my first post. Okay. But I want to use L32 in Single Mission. There is non date what I can change. And what I must do to play the two airships in the Campaign? Hello. I downloaded and installed the flyable AI Airships R 23 and L 32. by ojcar (models and skins by Stephen1918) http://combatace.com/files/file/13909-ai-flyable-rigid-airships/ But I only can select the R 23. I can't see L32 in the Aircraft selection. But I put both Airships in the aircraft folder. R 23 works fine for me, but what is with L 32? How I can fix that? Please help me. PS: Sorry for my english., I am German. Hello. How I use the L 32? I only can select the R 23. But I dont see the L 32 in Single Mission. And how I can use the L 32 in Campaign? Hi. 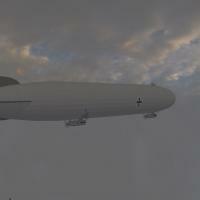 I have a nice german WWI Airship as SketchUp File. Is it possible to add this Airship to FE? If it is possible, can you describe me the steps to make this airship flyable in FE, please? Sorry for my english.